Buy the Behmor 1600 Plus Roaster today and we'll give you a $50 coffee credit. Coffee credits are as good as cash if you're a coffee lover - use one per order for any coffee beans in 1/2 lb or 1 lb sizes. These credits never expire. For more on how coffee credits work, see here. Green Beanery members also get a free extended warranty (membership is free but you must sign up). 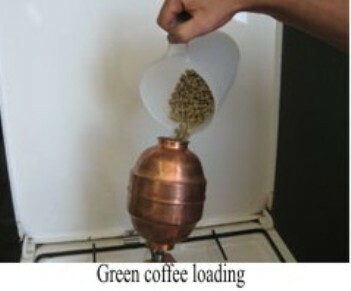 * The Behmor 1600 Plus Roaster's new features become active once a roast cycle has been started. Note: Do not leave your roaster unattended when in use. Warranty: 1 year limited warranty through Behmor Inc. Warranty covers replacement of a defective unit and/or parts, provided the Owner Registration Card has been completed and returned to Behmor Inc. (or completed online at www.behmor.com), within 30 days from the date of purchase. Full Warranty information for the Behmor 1600 Plus is listed here and should be read prior to purchase. Designed for use in 120V / 60hz environments only. Upgrade kit to convert Behmor 1600 to Behmor 1600 Plus. The Fresh Roast SR340 is a great "starter" machine for the home roaster who wants to taste truly fresh roasted coffee. The SR340 is an improved design over the SR300. You now have full control of the fan speed. The SR340 will roast a maximum of 5 ounces (2/3 cup) of green beans in 5 - 8 minutes, depending on the darkness level you desire. The clear glass roasting chamber allows you to watch the beans develop before your eyes. You can stop the roasting process anytime during the roast by tapping the "cool" button when you have achieved the desired depth of roast. The heat is pre-set and the capabilities to control the fan speed will make a great machine for the first time roaster. The Fresh Roast SR340 has the same capacity ( 4 scoops , 120 gm) and features of the SR300 and SR500 - plus a fixed temperature settings that can be adjusted from heat to cool at any time during the roasting process. The target temperature is 490 degrees. Digital display. Maximum time on the control is 9.9 minutes. The Fresh Roast SR 500 is a new and improved version of the Fresh Roast Plus 8, and a more powerful alternative to the new Fresh Roast SR 300. Offering the same roast capacity (4 scoops, 120 g) as the Fresh Roast SR 300 (twice that of the old Plus 8), the SR 500 features three temperature settings for easy adjustment at any time during the roasting process: 490 degrees (high), 455 degrees (medium) and 390 degrees (low). Fan Speed Control allows for fine tuning of the roast and adjustments of + or - 10%. Beans are their heaviest at the start of any roast, with fan speed control, beans can be kept fluid to ensure an even result. As beans become lighter, lowering the fan speed will protect beans from chipping. As an added bonus: the unit's transparent roasting chamber affords a front-row view of coffee as it roasts. Learn a lot from just looking! Versatile, simple to use with results you can rely on, the Fresh Roast SR 500 is a great deal more for a great deal less. A compact footprint allows for easy storage. Parts are readily available. Important: If the unit remains plugged into an outlet for a long period of time or is not switched to the OFF position after the COOL mode has finished, the machine will go to the "Sleep Mode". The machine will not operate. If this happens, switch to the Off position, unplug and wait 10 minutes. This will reset the unit, thus making it ready to roast again. Warranty: 1 year parts and labor through Fresh Beans Inc. (located in Utah). Tel. 1-805-501-7731. Warranty questions can be directed to the Green Beanery: sales@GreenBeanery.ca. Please note: the unit's top cap is made of fragile glass and plastic - handle with care. This part is not covered under warranty but is available for purchase as a replacement part. See the pros and cons of all our roasters. The FZ-RR 700 Home Coffee Roaster by Coffee Tech is a rather extraordinary pint-sized wonder, designed to go anywhere. Simply add heat and roast! Wherever you are in the world, you need never go without fresh roasted coffee, again. The FZ-RR 700 both maximizes the conductivity of copper and minimizes thermal accumulation, for an operational experience compared to the thrill of driving a Formula 1 racing car! 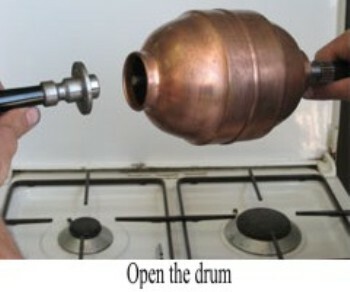 Few other units can compete with the close-range roasting experience this micro-roaster affords. 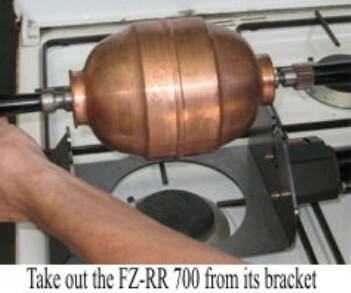 Essentially, a spherical copper barrel, the FZ-RR 700 can be placed on an open flame to operate. 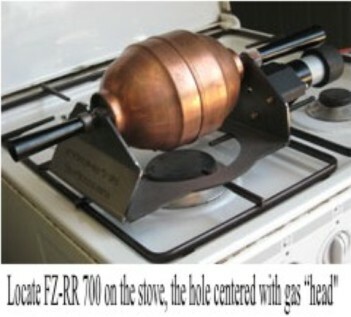 The manual operated FZ-RR 700 is suitable for use on a home gas stove. 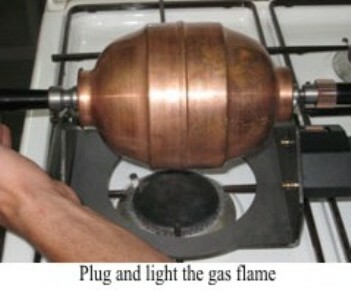 A motorized version of this roaster is not yet available. Machine capacity: 7.05 oz/200 gm. Note: All roasters run the risk of fire hazard. For this reason, take care never to leave your roaster unattended, when in use. Warranty: 1 year parts and labor through Green Beanery.